At present most of the time travel movies I find are foreign films on Netflix® This is another Indian (India Indian) production, and it is very slow-paced and subtitled but not dubbed. I think it took most of a week for me to watch the slightly over two-hour film the first time, and as long again for the second viewing on which I took notes. That's not to say it isn't an entertaining film. It has some very strange ideas about time travel. I won't say it's worth watching, particularly, but I will say it's a film whose existence you should recognize. Not unexpectedly, no one in the film looks familiar. The last foreign film I watched was from Brazil (the excellent O Homem Do Futuro), and the last Indian film was equally slow-paced and while interesting not terribly exciting or memorable (see web log post #206: Temporal Thoughts on Colkatay Columbus). The main character of this film is a television producer who thinks that his life is too often like movies he has seen, and he sometimes comments that something happening in his life is like this or that scene from this or that film. I don't know how true that is, but really, if you watch enough movies they are going to depict enough life-like events that most things that happen in your life will be reminiscent of something you saw in some movie at some time. Abby Sen, the title character, doesn't quite grasp that, and worries that things which have not yet happened might be like movies he has seen, such as being worried that if he travels to the past, as has been suggested, he might meet his own mother and have her fall in love with him as happened to Marty McFly in Back to the Future. For what it's worth, that doesn't happen to him; but other things do, and we're not always certain what they are. As mentioned, Abby Sen is a television producer. Unfortunately, he keeps losing jobs--he has been fired seven times from various stations, all after short stints. We meet him at 11:30 A.M. on May 26th, 2013, somewhere in a park in Kolkata. He is asleep in his car when his phone rings; his wife awakens him. His wife is certainly part of his trouble. It seems she married him for the money she expected he would earn, and whenever he gets a job she rushes to the stores to buy many beautiful and expensive items--furniture, furnishings, clothing--and then when he loses the job she becomes upset and uncontrolably enraged, destroying everything she bought. When she calms down, she tries to console him by saying that it's all right, she knows where she bought everything and can replace it all just as soon as he gets the next job. He obviously needs a job; he can't keep one. The problem seems to be that he's too serious for the competitive entertainment industry that is television in 2013 Kolkata. Industry insiders say he's very good at what he does, but can't anticipate what the audience wants, offering cultural and educational programming to an audience that wants pablum and excitement. His best friend manages to wangle an audience with one of the top experts on television in India, and they go to see him. He's a bit flakey, perhaps, but he goes through his files and produces a clipping. He says that Abby would succeed at a place called Grand Channel. It seems that in 1979 it launched as the first private television station (that is, not government owned and operated) in India, but by 1982 it had closed. In the midst of this, in January 1980, they advertised for television producers, and the expert believes that Abby would be hugely successful if he could land a job there then. 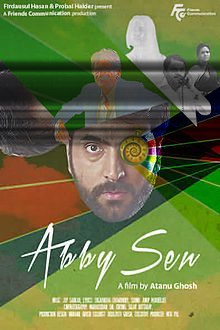 Quite logically Abby and his friend think the man has gone off the deep end, but the expert produces news reports to the effect that a scientist named Priyangshu Sharma has developed an effective means of time travel and is seeking someone to travel through time and return as independent corroboration of his success. Pressured by his friend, Abby arranges to meet Sharma. Sharma likes Abby--who apparently holds degrees in scientific fields and understands at least some of what Sharma is explaining in relation to time dilation and temporal issues. He is reluctant to commit to something so crazy, but ultimately decides that he needs the job, and he might be able to get the job, so it's worth making the attempt. In general we don't worry too much about how time travel is accomplished in these stories, because there's no good basis to know what actually would work, and most of the things we imagine wouldn't. We accept that the time travel problem has been overcome somehow, and go from there. However, this is one of the most peculiar methods of time travel yet suggested, and it becomes more peculiar as its details emerge. Those details are not only odd in themselves, they are delivered to us in odd ways. It is as if the filmmakers shot the entire thing from beginning to end, and along the way at some point they said, "Oh, we need for this to be true about the time travel thing, so let's shoot a flashback to Sharma explaining this part to Abby before he left and include it here." I suppose we should be grateful for this awkward handling of these story elements--I wonder how much longer the film would have been had they actually had Sharma say all this at the beginning and then had the flashbacks to remind us of them when they mattered. Here is a list of the confusing mass of time travel issues. To travel to the past, Abby must swallow a pill. Within a few minutes he will pass out, and awaken at a point in the past determined by the programming Sharma has included in the pill. He takes with him another pill, in a glass bottle. If he swallows this pill within forty-eight hours of his arrival, he will return to the future; after those two days, the pill becomes inert, and he will be unable to return for a year. It is not said how he would manage to return after a year, whether it happens automatically or if there is something he has to do to activate it or prevent it, but the notion that if he misses the forty-eight hour window he will be stuck in the past for a year arises several times. He also is given an electronic device about the size of a pager with a video screen, by means of which he can communicate directly with Sharma, but only between six and six-thirty in the evening his time. He can take with him, in either direction, anything he can contain within his own clothes. However, if he takes anything that "doesn't exist in 1980" it will become a toy. We'll return to this point, and probably to several others. Someone in the target area will recognize him and believe that they are close friends. The only explanation given for this by Sharma is that it is part of the "magic" of the method. I kind of hope that was a poor translation. The time traveler will not be visible in photographs, so should avoid being in them. This has no plot consequence, but is explained as being because he is not really there. Despite not really being there, he is able to manipulate objects, touch and be touched, hug people and in one instance lift someone off the ground, operate machines, talk with people and see and be seen by them, and everything else we suppose requires a corporeal presence. At one point he even becomes ill, with a high fever. The notion that something that reflects or emanates light cannot be photographed on film makes no sense. Even holograms appear in photos. The notion that he is not really there does not really track, and was not at all necessary to the plot. It appears that time runs concurrently in the past and the future, that every day Abby spends in the past is a day advanced in the future. We'll come back to that, too. Sharma has microchips embedded in his body. Among other things these enable him to communicate with Abby by talking to his hand. Apparently, though, if they are damaged Abby will lose his connection to the world and become an orbiting satellite. This is because Sharma controls his location by means of those circuits; yet they do not enable him to bring Abby back without the aid of the other pill. It was possible to rescue Abby from the past by sending another time traveler with a replacement pill. The expiration time is apparently in the pill, not in how long he was in the past. You can probably see that there are a lot of problems with the time travel method; hopefully we will cover the ones which matter. Sharma warns Abby that anything he takes to the past that did not exist at that time will become a toy. That would explain why cellular phones wouldn't work (although seriously, cellular phones wouldn't work because there would be no cellular network). However, beyond that it becomes particularly confusing. The temporal communicator works. The return trip also works--and since it is programmed and somehow connected to the microchips embedded in Sharma's body, it must contain at least some microelectronics and thus be something that did not exist at that time. Further, in the literal sense none of Abby's clothes existed in 1980; Abby himself had not been born. Certainly clothes did exist in 1980--but the creep of technology might well mean that some of what he wore was reliant on technology that did not exist then. He brought a photo of himself with his wife, and it was unchanged. His watch comes through intact, and it was engraved as new sometime after his birth; it is likely that improvements in watch design were incorporated into a watch that was worth giving as an engraved gift. Yet upon his arrival in the past it appears to be fully functional, up until it is stolen. You might argue that a watch is still a watch, clothes are still clothes, photographs still photographs, and all these objects existed in 1980. What, though, is a cell phone but a computer connected to a radio and a television? And computers, radios, and televisions all existed in 1980, and in fact were already connected to each other in some ways. The technology had improved massively--mostly due to the United States space program's call for electronic miniaturization--but it all existed. So it seems that the statement that objects taken to a time before their own existence become toys is meaningless and inconsistent. One one level it seems such a small matter: someone in the past recognizes the time traveler as someone he knows well and hasn't seen for a while. It proves to be a very specific memory--not "Don't I know you from somewhere?" but "Last time I saw you was when Pele shot the goal on the penalty." O.K., I don't know much about sports and less about international soccer/football, but I do that Pele is perhaps the outstanding player in the game, so this specific memory could be of any of many different games, but it's still specific in the mind of the friend. It is a bit unclear who this friend is. At first it appears his name is Bila; that is what Abby calls him when he gives his address to Paroma. Later it becomes apparent that the friend is named Sambat Bose, or something like that, although he is listed as Bila in the credits on IMDB. We will call him Sambat. Part of the problem is we don't know what has happened to Sambat. Is he remembering a genuine experience, in which case somehow when the pill sent Abby to 1980 it sent a duplicate of Abby to a previous date, said duplicate having only a temporary existence outside Abby's knowledge but meeting and befriending Sambat and becoming a dear friend of his before vanishing? Is he misremembering a genuine experience, in which case Abby has been mistaken for someone else who might appear at any time and confuse the issue? Has he been given a false memory, remembering a friendship which never happened, in which case it is very likely that he would eventually introduce Abby to people he believes already met him, and will have to reconcile the discrepancy that they don't recognize their former friend? We are not given any information to support any particular view. However, whichever is the case, history has been altered outside Abby's conscious actions: someone has memories of him having existed at a time prior to his arrival, and will carry those memories forward into the future. Of course, if we assume a fixed time theory world, then nothing has changed; Abby always arrived in the past, and Sambat always had the memory of their prior relationship. It is convenient for the plot (it gives Abby resources in the past to get to the point he needs to be), but it is very awkward for the time travel story. We discussed this problem rather thoroughly in our analysis of Frequency years ago: how can someone in the past have a conversation with someone in the future? The answer in fixed time is that the conversation has always occurred, that it is in some sense not different from two people speaking on the telephone in different rooms. However, that requires that it is impossible to change the past, or indeed to change the future, because everything that ever happens has already happened and cannot be altered. Not only do we not really believe that, we cannot live like that; we can only make choices within the structure that we believe our choices matter. It might work in multiple dimension theory, if Sharma in one universe is conversing with Abby in another. Sharma dismisses multiple dimension theory early in the film, and does not believe that it applies here, but he could be mistaken. The problem in replacement theory is that if Abby is actually changing the past, the future cannot exist until all intervening events occur. That means that Abby sends a message to Sharma, and waits but does not get an answer, finally deciding the device is not working and making decisions, living his life in the past, until one way or another we reach the moment in the future when Sharma receives the message (assuming history is not changed in a manner that undoes Sharma). Sharma sends his answer, which reaches Abby what we would call immediately, and changes the past because he now has received the response--but when he replies he is again cut off and does not understand why the device never works again, but time again continues into the future until Sharma gets the message and again answers, again sending information to the past which alters all of history from the moment it is received. We thus have a very complicated communication that requires time to replay itself every time a message is sent from the future to the past, and in which anyone sending a message from the past to the future only receives the answer if this is not the first time through history for that message. It is more complicated than that, depending on how the system works, but temporal communications are as complicated in their impact on history as time travel itself. They are time travel in which information travels through time altering the past. Abby does not meet his mother. However, through an improbable sequence of events, he meets his mother-in-law. Her name is Srirupa Mukherjee; he mistakenly asks if she is Srirupa Chatterjee, her married name, and she corrects him, and he avoids explaining that he knows her name from the future, instead saying he learned it from one of her students and simply got it wrong. The 1981 census reports just over nine million people in Kolkata (then spelled Calcutta, the spelling changed in 2001). It happens that Abby picks up some papers a man left on a bus, finds his name and address among them, and returns them, and overhears his mother-in-law tutoring a young girl in the next room. He waits to meet her, introduces himself and explains that he has traveled from the future but events are not going well. He did not get the job he sought, and he knew she was a wise woman so he sought her advice. She knows someone named Paroma, who just recorded a video with Grand Channel and so has connections. They agree to say that he is from Bombay, not the future. As the narrator says in The Phantom, every movie is entitled to one remarkable coincidence. This one has more than one, but it does a fairly good job of making them seem natural. Abby specifically does not tell Srirupa that he is her son-in-law. He simply explains that he came from the future to get a job. He gets the job. He also meddles in Srirupa's life, and probably also in Paroma's life. It is in connection to his mother-in-law that we have the most challenging temporal issues. The facts are a bit confusing. When Abby meets Srirupa, he gives her the address where he is staying. He is staying with Sambat, but there is no suggestion that Srirupa recognizes the address. Later, Srirupa shows Abby photographs of paintings Sambat claims to have painted, and says that she wants to marry Sambat Bose, not the groom her father has chosen, Prithwis Chatterjee. Prithwis Chatterjee is the name of Abby's father-in-law. He is very concerned that he needs to prevent this marriage and steer Srirupa toward the correct husband. She asks him to speak to her father, to persuade him that the creative fields have a future; he arranges to speak to her father but tells him that his decision to marry Srirupa to Prithwis is good, and that Sambat is unlikly to be able to provide a stable future, something that does not exist in the creative fields. Srirupa learns of this and is furious. She elopes with Sambat. Paroma says Abby should not take it personally; Srirupa was going to elope with Sambat if her father did not give permission for them to marry. It was inevitable. However, Abby is now certain that his wife will never be born, that he has altered the future in a serious way. He even has a strange experience, to be discussed next, in which Sharma appears to him in the past and informs him that his wife no longer exists, that he has severely altered the geneaological succession. However, it is entirely unclear whether Abby is responsible for Srirupa meeting Sambat. Sambat is Abby's roommate, who effectively tosses him out when he discovers that he has told Srirupa's father to oppose the marriage. We know that Abby meets Srirupa within the first twenty-four hours of his visit, and that forty-eight hours elapse before he gets the job at Grand Channel. It would be a whirlwind courtship, but stranger things have been done for love. Srirupa already knew Sambat but did not know him as Bila, and so she did not recognize the name or address immediately. She already intended to marry him, and when she learned that Abby was rooming with him she decided to ask for help. Nothing was changed except that Srirupa was angry at Abby, and the marriage was ill-fated and collapsed anyway. This is fixed time, and it was always the case that Abby attempted unsuccessfully to scuttle that marriage. Abby has altered history, but history in this world is self-correcting, and since Srirupa wasn't supposed to marry Sambat the marriage failed and she wound up married to the right man ultimately anyway. Abby was very lucky, having altered history in a potentially serious way and having it fall back into course fortuitously without his intervention. That brings us to one of the odder sequences in the film. Some things are not going well for Abby, other things are. On the positive side, he has been recognized as a top flight producer at Grand Channel, and is being promoted rapidly over the heads of jealous colleagues. His understanding of how to shoot dance and concert performances has him top of the list for a channel trying to distinguish itself in a field of mostly government-run competitors. On the negative side, he lost the return pill and the future communicator, and it appears that his mother-in-law has eloped with the wrong husband so that his wife in the future will never be born. He is stuck here for a year. On top of that, he is falling in love with Paroma, who is falling in love with him, but it would be nearly impossible for him to marry her for a host of reasons, including that he eventually has to return to the future. In the midst of this, in the middle of producing a video of a performance by an internationally acclaimed jazz musician, something happens to him--and we are not entirely certain what. However, we will begin with what we see. While he is producing the video, instructing cameramen and working the board, he suddenly sees Paroma dancing through the scene. He loses focus and is inattentive to the work. Abruptly Sharma is there. He says he had to come this way because Abby lost the communications device. He also says that Abby's wife has disappeared. Abby is pulled from this by one of the technicians asking if he's all right and telling him that he stopped recording. Abby resumes recording immediately, and continues to finish the video. The issue at hand is, what just happened? Our impression is that Sharma has used some other trick he didn't mention to communicate with Abby, pulling him into some sort of semiconscious state in which a message could be delivered. It suggests that Sharma knows Abby lost the communicator because Abby stopped calling him; it also tells us that Abby has changed the future, because his wife has ceased to exist. Setting aside the problem already considered regarding communication across time, it means that Abby's interference in Srirupa's life has changed the future, and despite the fact that it's going to change back it is at this point altered. Yet that suggests that Abby's presence in the past creates a link between two points in time and if he changes events in a way that might have consequences in the future, it does have those consequences, even if subsequent events would change them back. That's just an impossible theory of time. Either Srirupa stays with Sambat and Abby's wife is never born, or Srirupa leaves Sambat and marries Prithwis. The alternative is that nothing temporal happened. Abby has become overstressed by the fact that he lost the return pill and the communicator and now has somehow changed history such that his mother-in-law is married to this artist instead of to his father-in-law, and he's sure his wife is never going to be born. He hallucinates the entire encounter; none of it is real, Sharma is not communicating with him from the future, and his wife has not disappeared. Perhaps it was lost in translation, but I'm pretty sure that's what we should believe happened, even though Abby believes it was real. What no one ever said: "If you lose the pill, or fail to take it within forty-eight hours, I would have to send someone else back in time with another pill to remove you from the past." That seems rather a silly oversight, since there is repeated emphasis on the notion that once forty-eight hours have passed the pill is useless and Abby is stuck in the past for a year, but suddenly when there is a problem in the future Sharma suddenly realizes that he can pull Abby out of the past by sending someone back with another pill. Of course, this is fraught with problems. The first problem is the same problem we had with the communicator: if it is possible for Abby to alter history, then nothing can happen in the future until the past has played through to that future moment. That means that Abby will live in the past for at least a year (assuming that after the year he can extricate himself from the past), possibly for over thirty years (if he has to live until his departure in 2013). It is not until the future arrives that Abby's wife can as much as notice that he vanished from the kitchen, and only then can she contact the police, and only then can they harrass Sharma. As noted, the notion that time moves at the same rate in the past and the future can't easily be supported unless this is a fixed time story--and too much about this story is about the importance of making good choices, which is nonsense in a fixed time world. Sending the second person to the past changes history again, of course. That person tells a lot of people that they should enjoy the park because in a few years it will be destroyed to build a bridge, but that probably doesn't have much impact on them--they just assume he is some kind of nutcase. In addition to informing Abby that it is necessary for him to return to the future (and explaining some of what we have already covered, none of which was known before this moment), our traveler buys probably several pounds of gold, which he tapes to his body under his clothes in the expectation that this will bring him significant wealth in the future. There are a lot of nuances to this, including that he is reducing the gold supply between 1980 and 2013, which will increase the price some small amount, and when he sells the price will fall incrementally, but this is not different from someone hoarding the gold in a safe deposit box or other secure location during that time--it only matters because this was gold which otherwise would have belonged to someone else, so the supply is slightly reduced. What is more difficult is how he purchases it. I don't know much about currency in India, but in most modern countries new versions of the paper money are published periodically--certainly not less frequently than every decade, and these new versions have dates on them. Banks generally remove old bills from circulation to swap for new ones, so that worn out money does not fall apart completely. That means it is unlikely that our traveler would have cash that was valid in 1980, unless he spent money on collectible bills (and this is not particularly a common collectible) or brought back something else that he sold for cash which was worth as much in 1980 as the gold he purchased. Of course, maybe old money is common in India--but since most countries do not use paper of the same quality as the United States, it is unlikely that such old currency would be in circulation. It is a clever idea, but it requires considerably more preparation than simply taking some cash back and buying some gold with it. This second traveler also brings back the news that Srirupa's first marriage lasted only three days, and Abby's wife has not ceased to exist. This confuses Abby, who had been thinking that he would bring Paroma to the future with him, but now discovers that he is still married in the future. Paroma won't meet him to say good-bye, having learned (indirectly through Paroma's mother) from Srirupa about Abby's actual origin. Abby returns to 2013, avoids the press as much as possible, and goes straight home to his wife. She is again furious that he would leave her for several days even to get a job. The film closes with him asking the audience whether it should now say and they lived happily ever after. That is not our concern, of course. We want to know whether the story is possible--and if you accept a fixed time notion with past and future moving at the same rate, then yes, it is. However, it also undoes any notion the story might be about making choices, because under fixed time choice is illusory. Our verdict is that this would be very different were it a replacement theory story, and ultimately would probably be a disaster. We also never learn whether the now famous time traveling Abby Sen can get a job in 2013. That apparently is not the point, either.